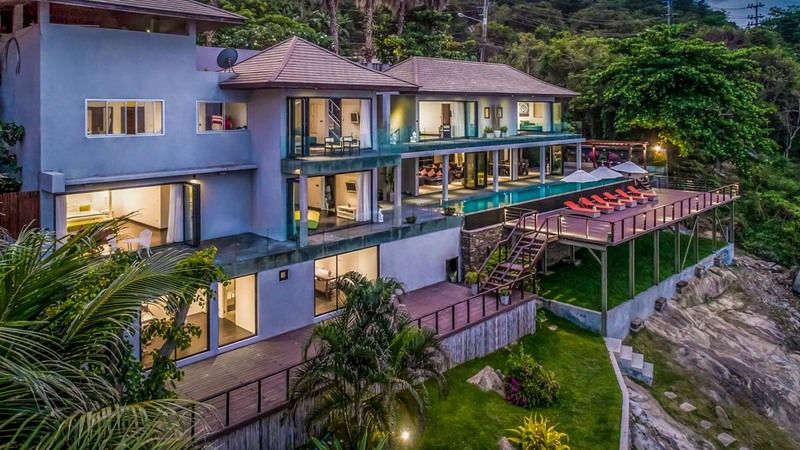 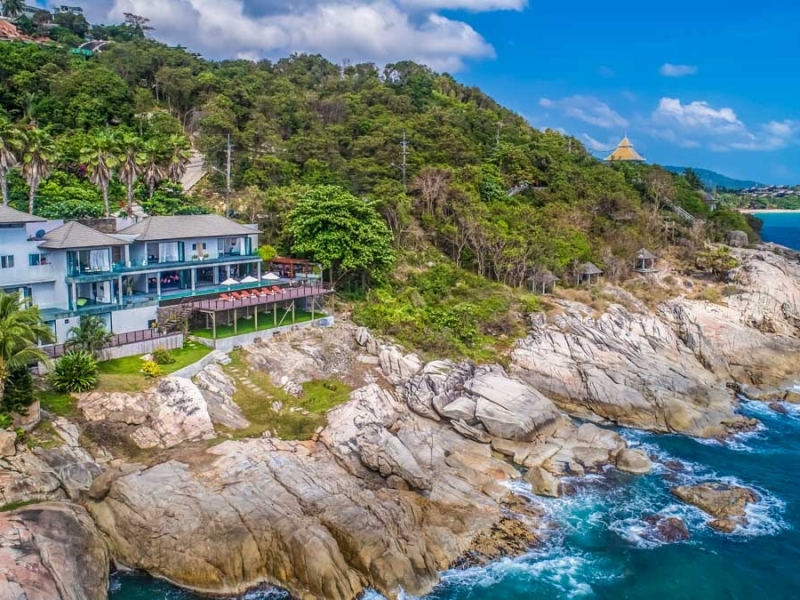 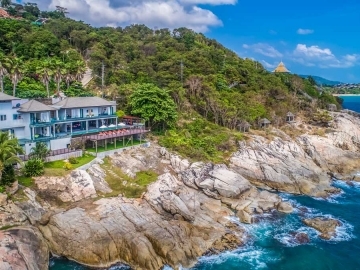 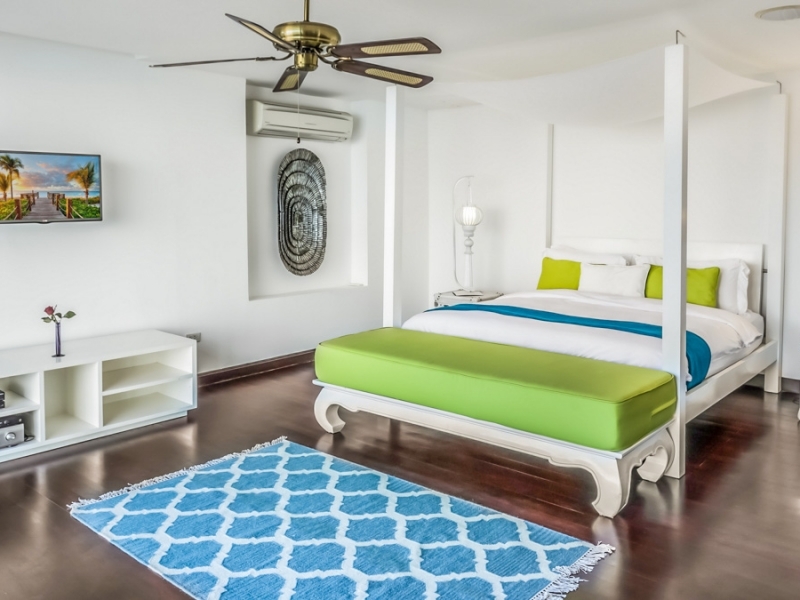 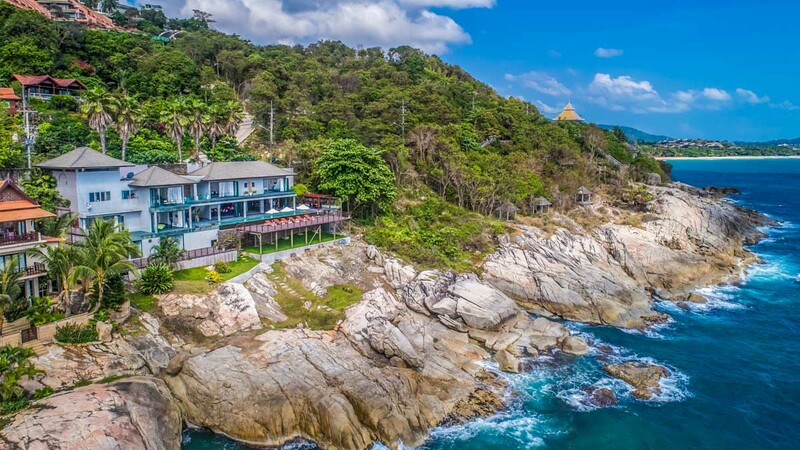 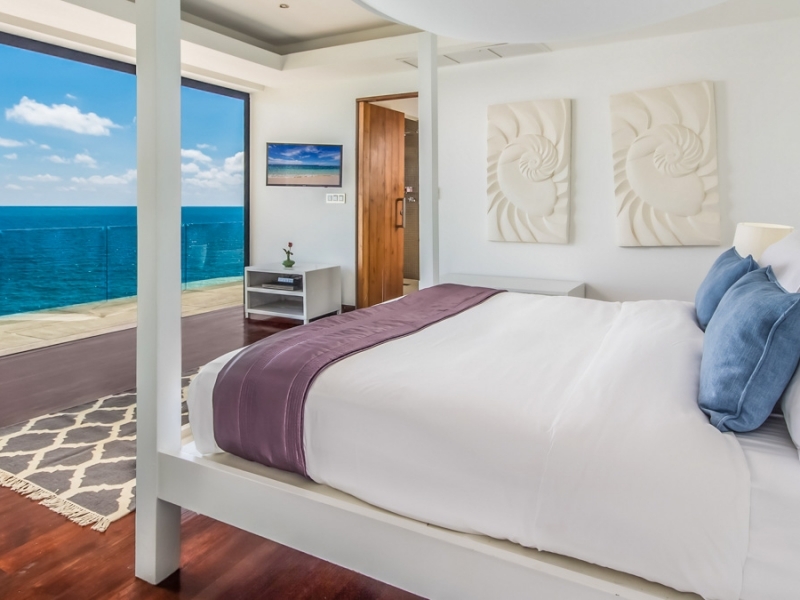 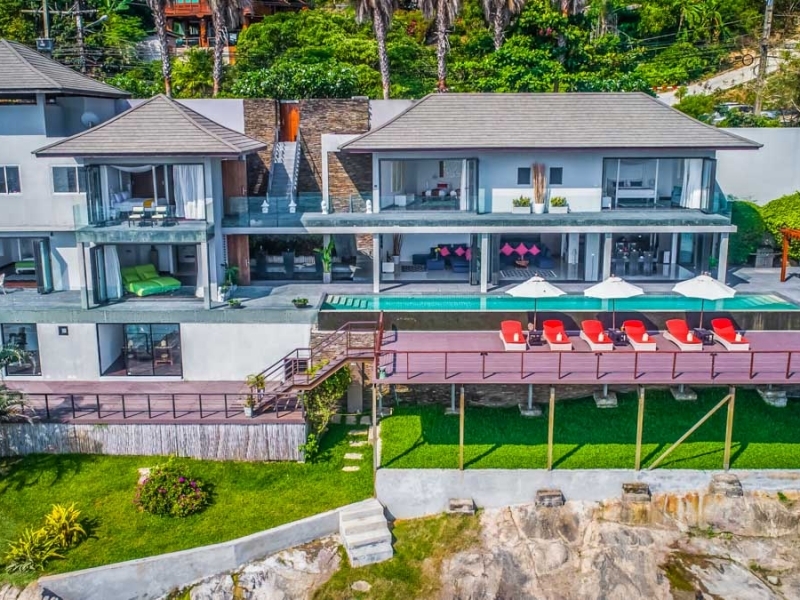 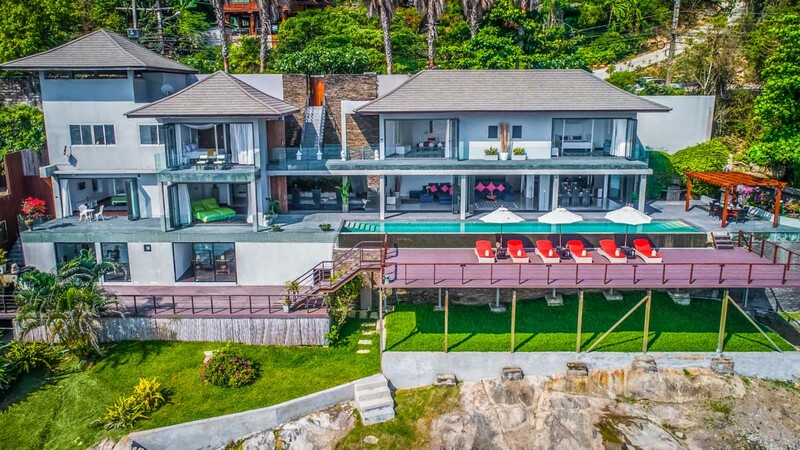 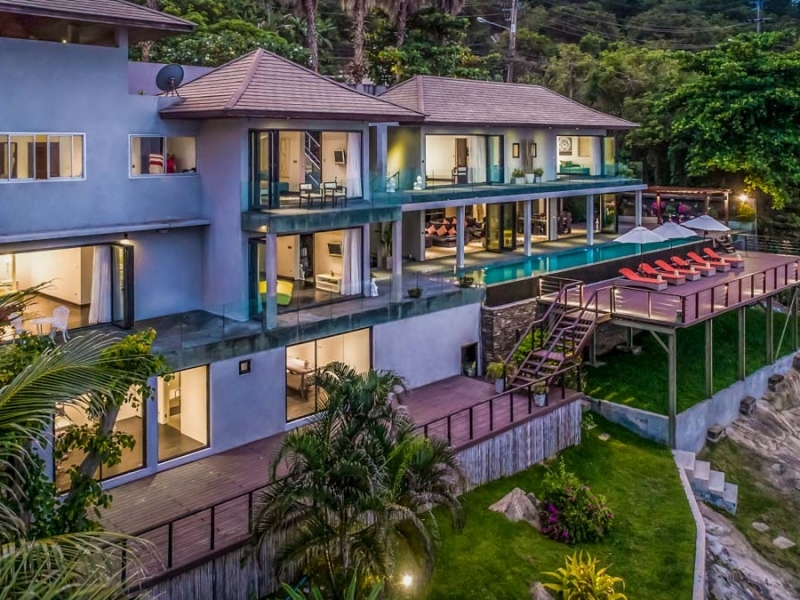 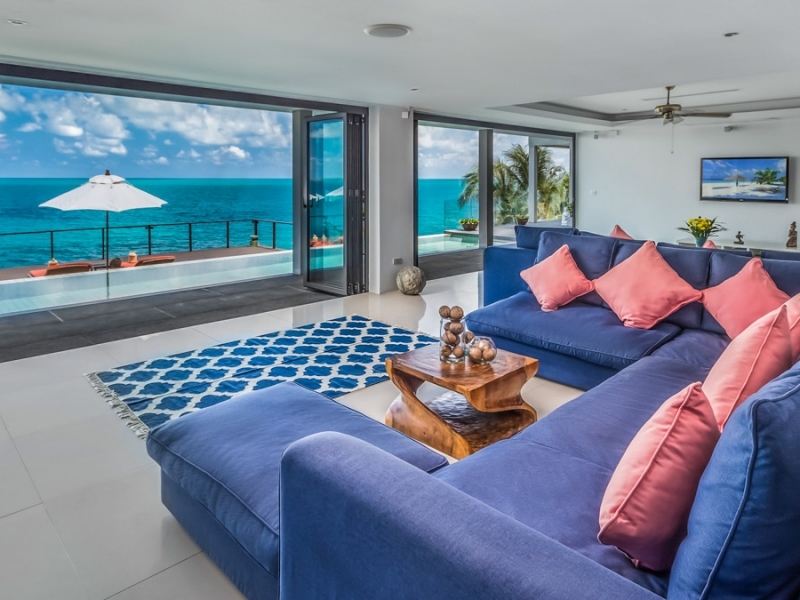 Villa Samayra is a 5-bedroom oceanfront villa fabulously located to provide a 180 degree sweeping vista of the rocky coastline, coconut lined beachfronts and azure ocean below. 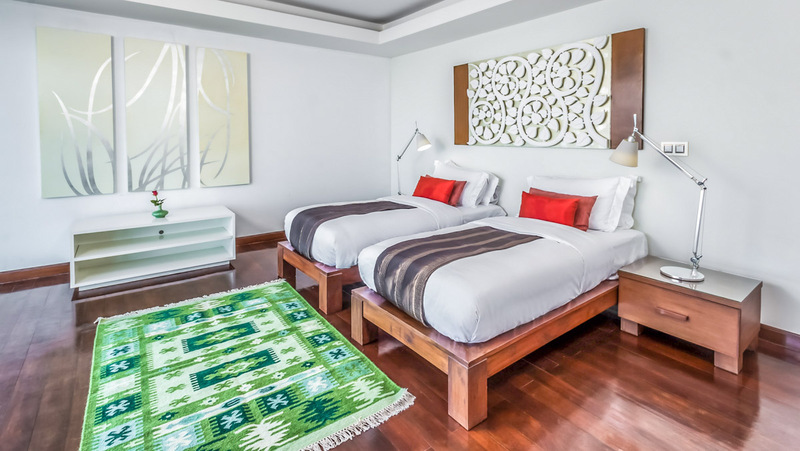 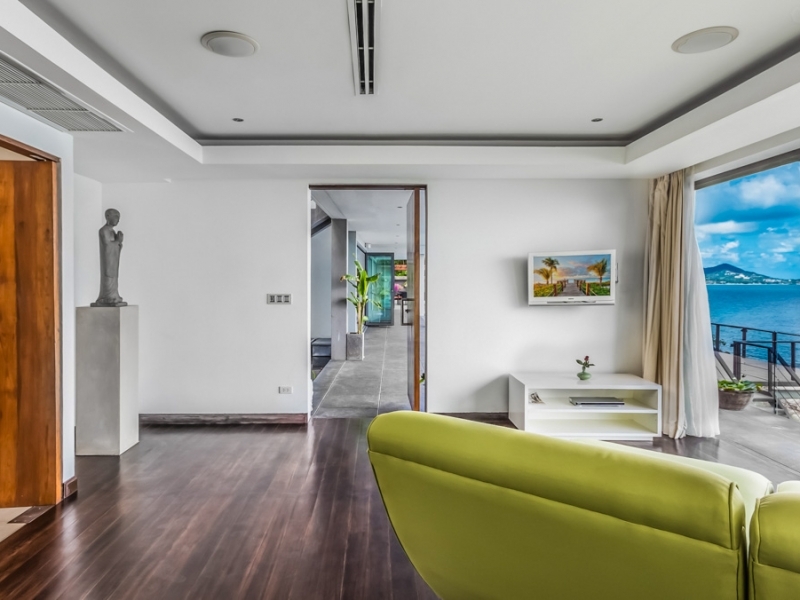 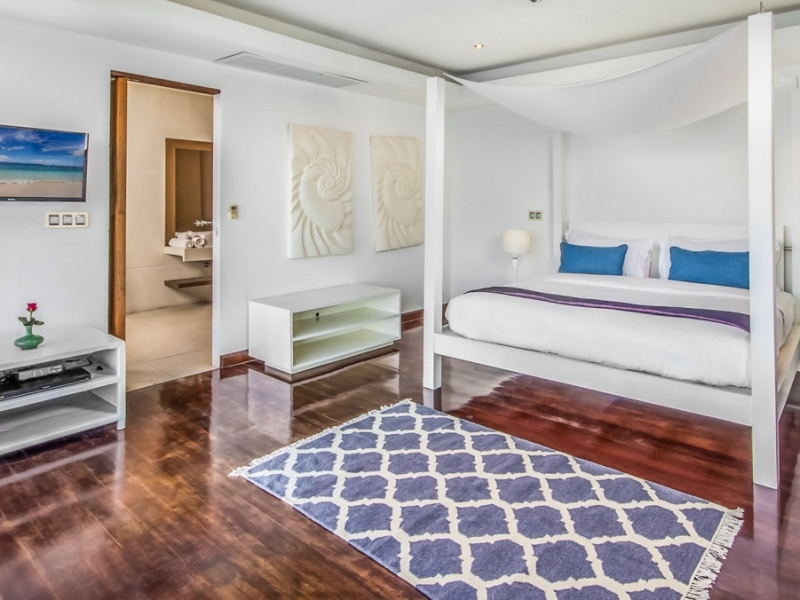 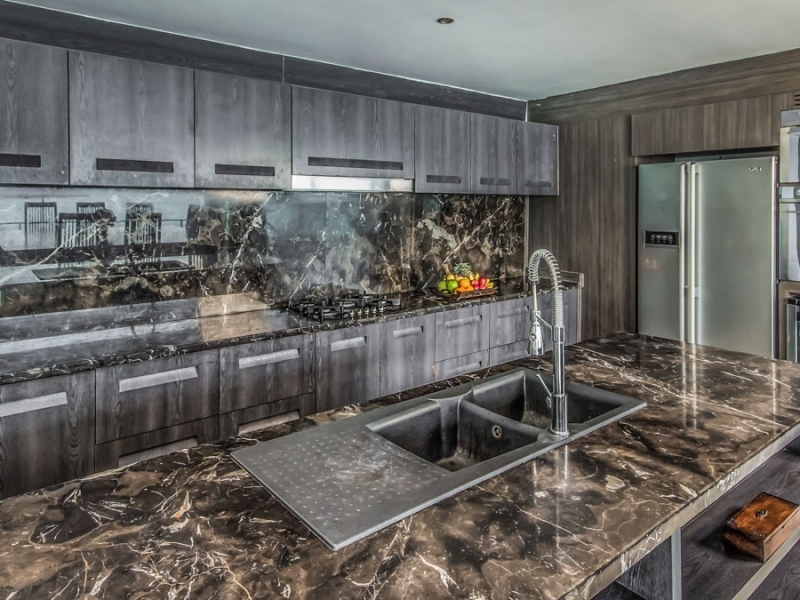 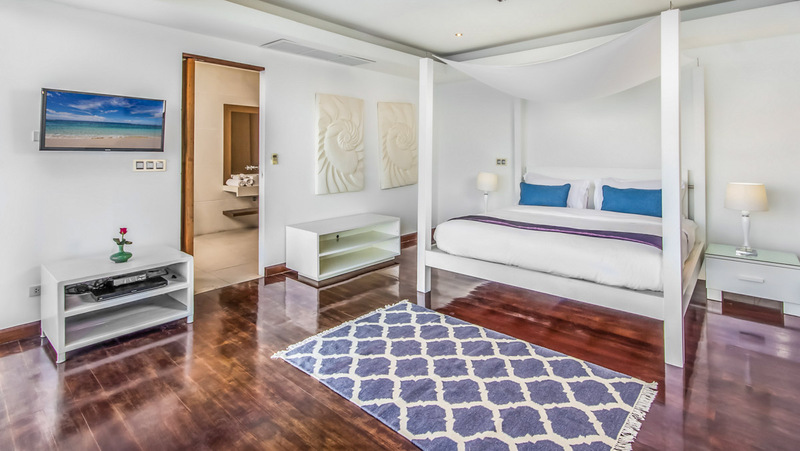 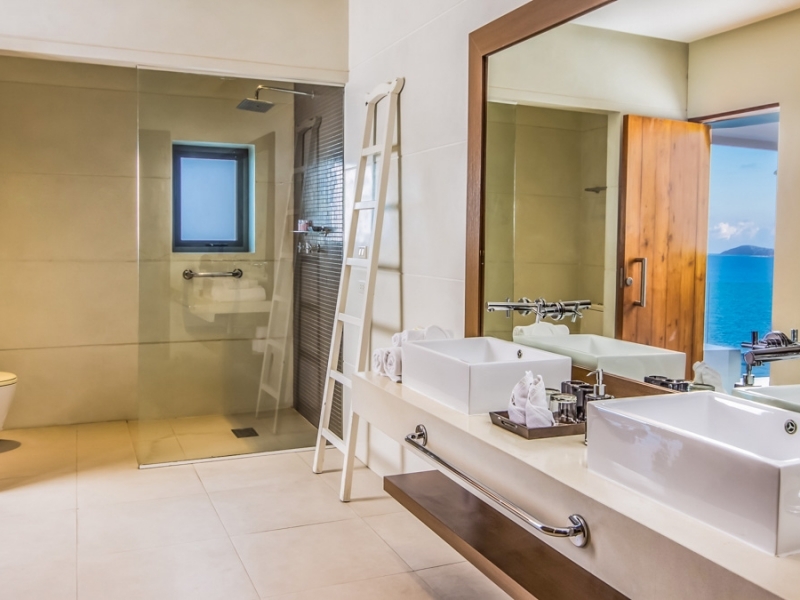 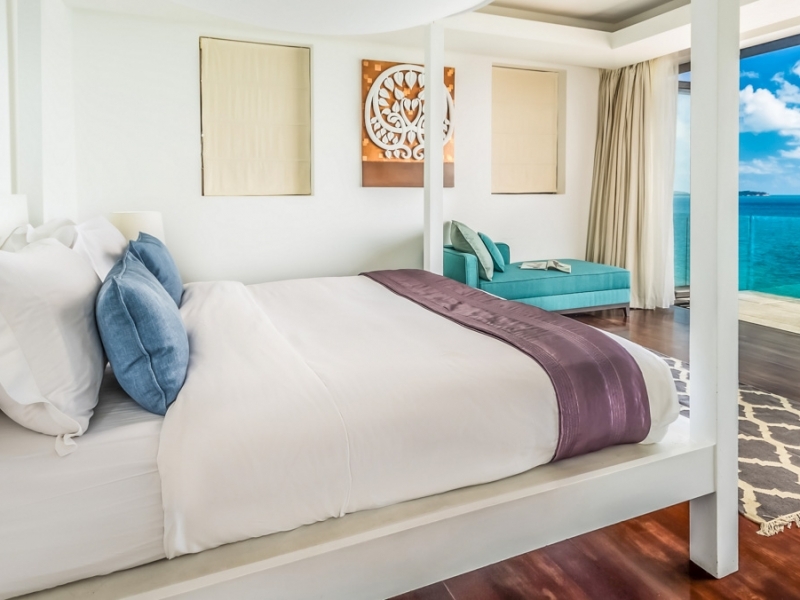 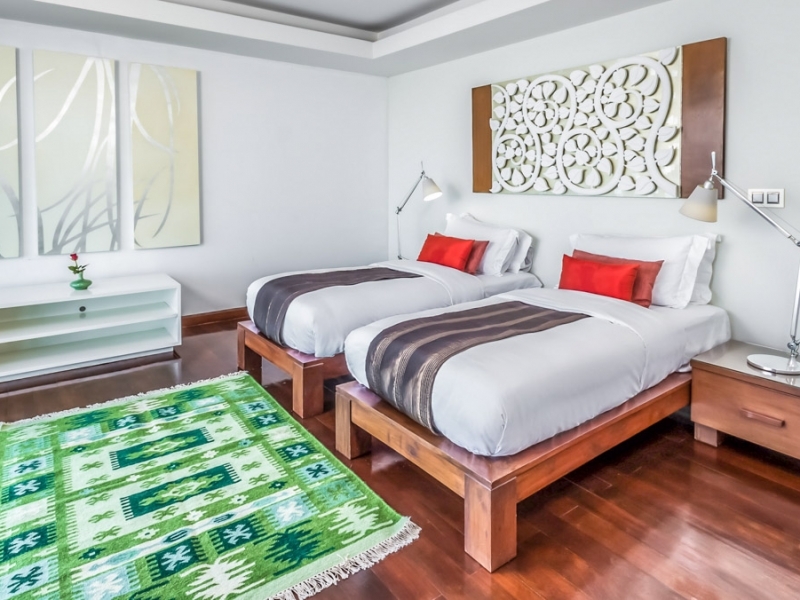 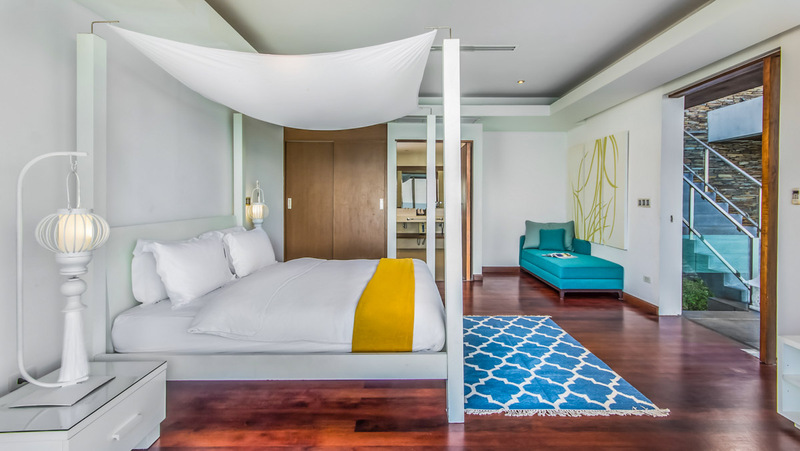 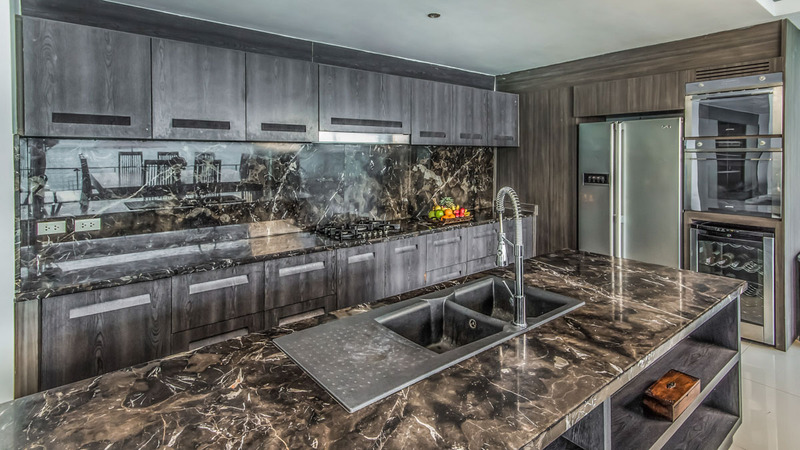 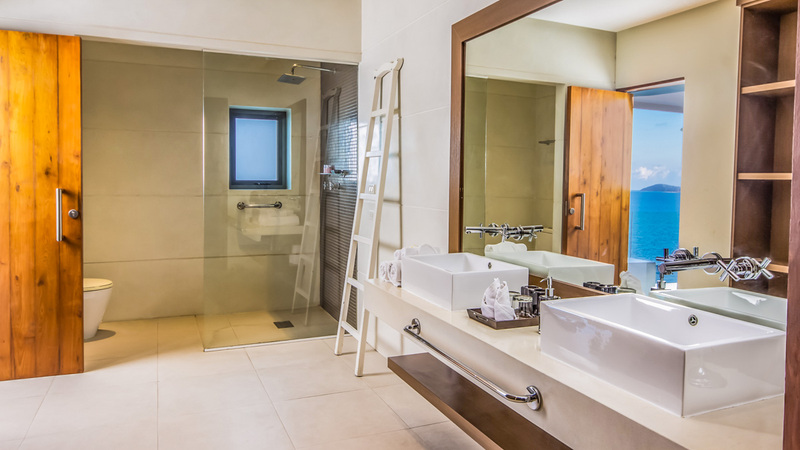 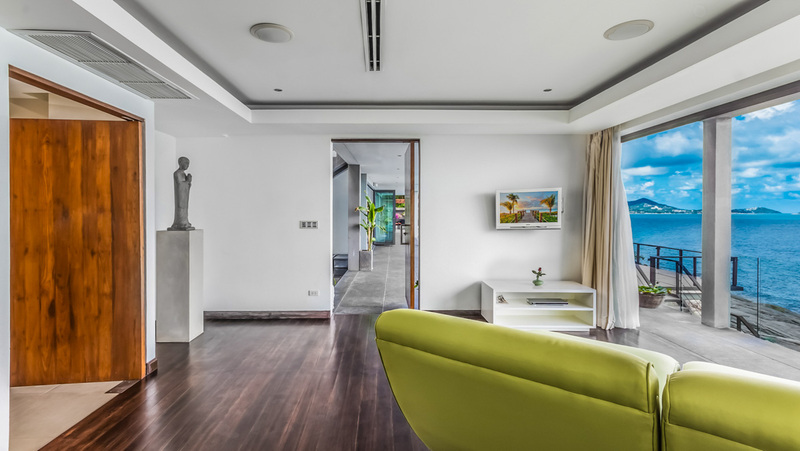 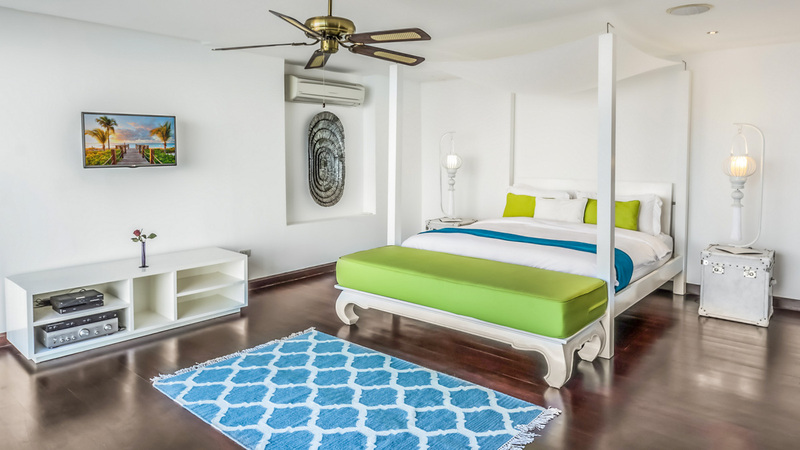 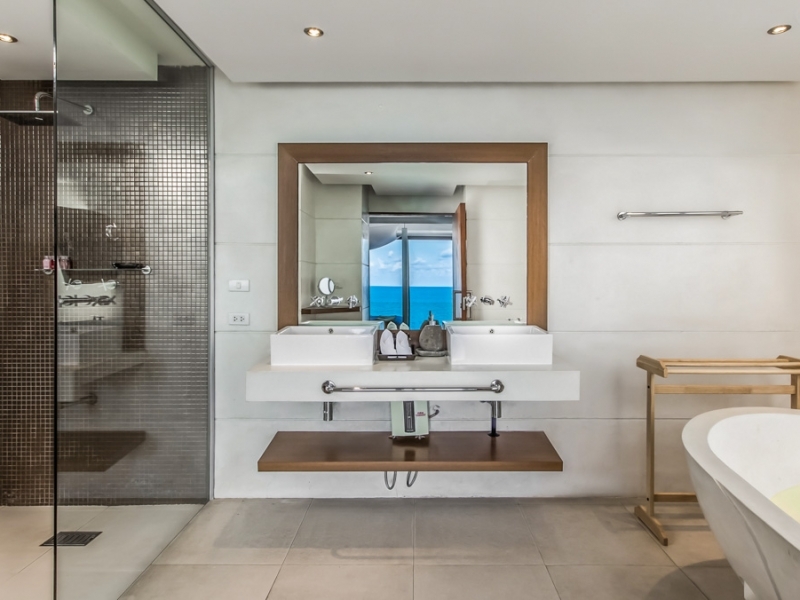 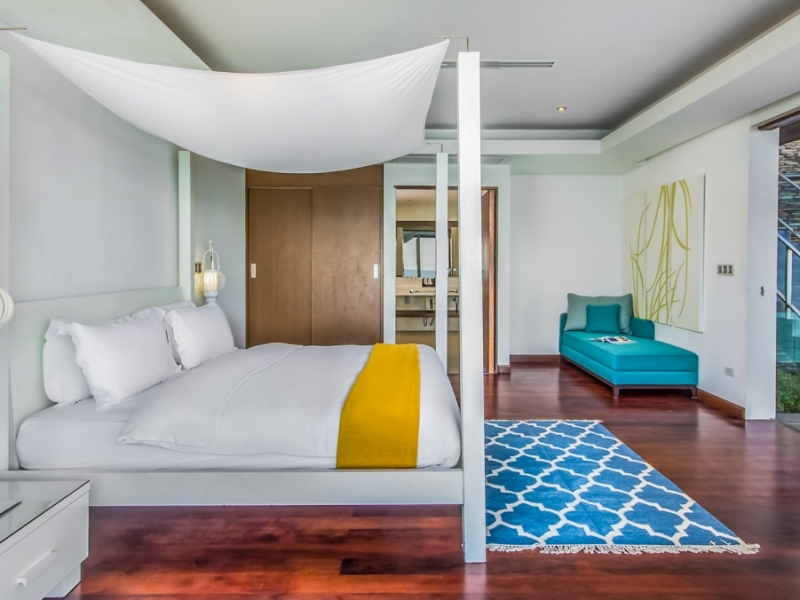 The interior of this Luxury Villa is spacious, with a lot of natural light, and includes contemporary art pieces, state-of-the-art LED lighting system, Jim Thompson furnishings, and a terrazzo swimming pool. 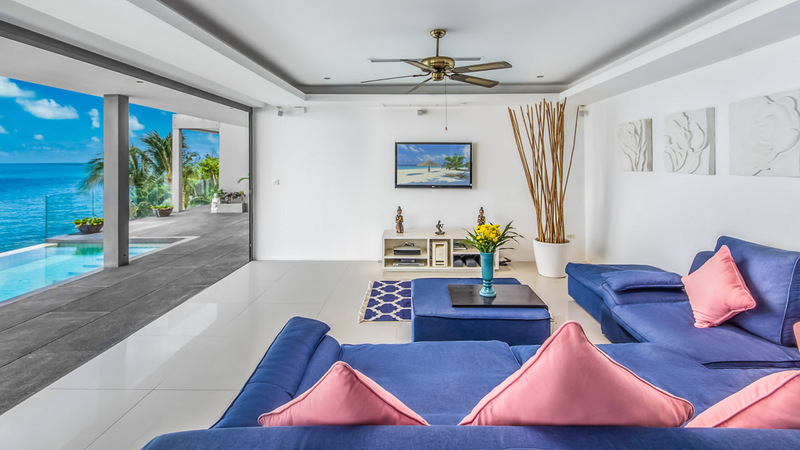 From the main villa, entrance steps lead down over a koi pond, leading to the master bedroom suite, a lounge, the dining and kitchen pavilion, and an infinity pool with a spacious terrace and a pagola for outdoor dining. 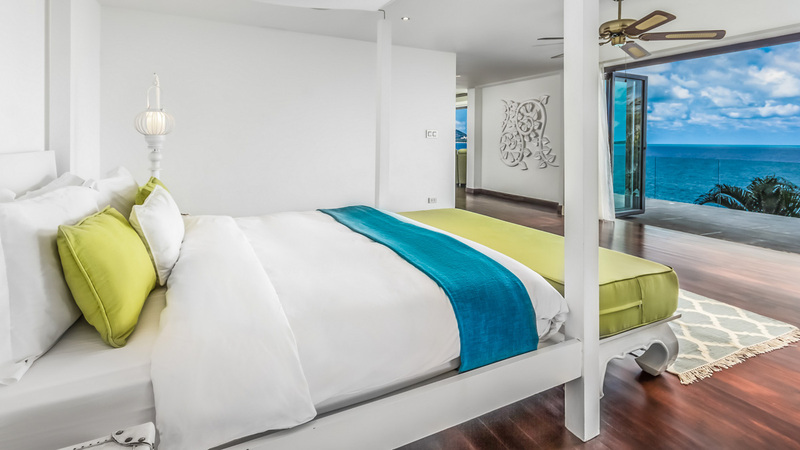 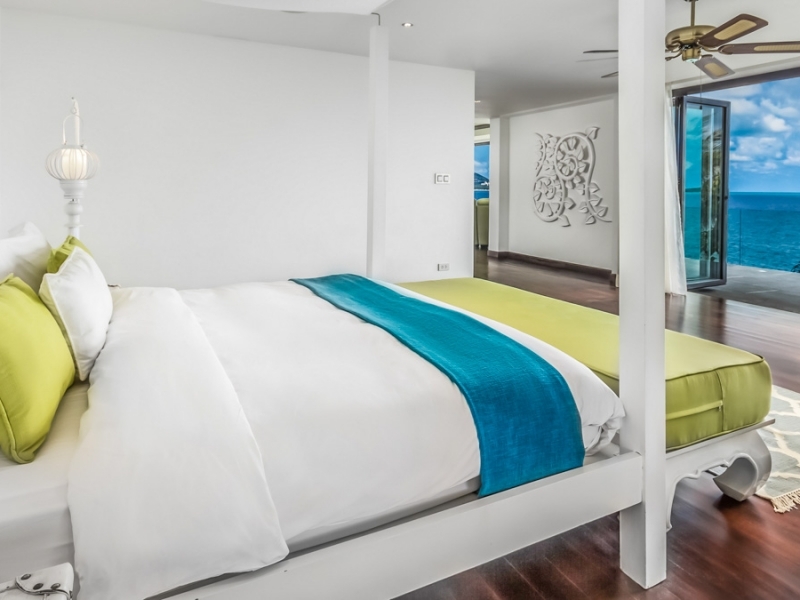 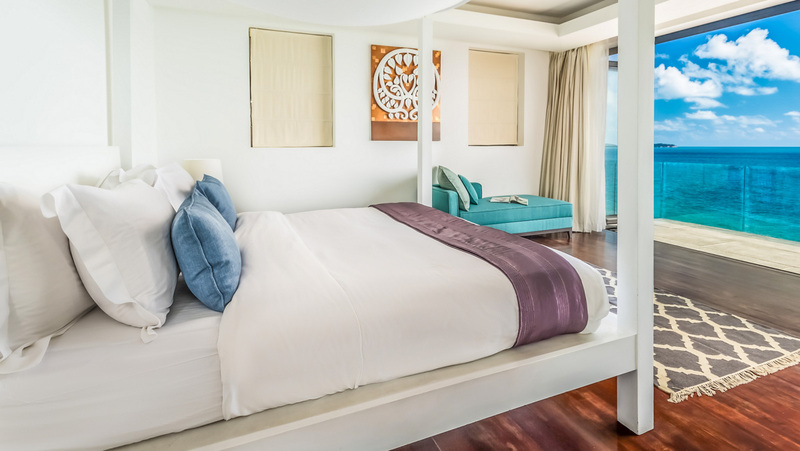 The massive master bedroom features a four-post king-size bed surrounded by contemporary artwork and decoration. 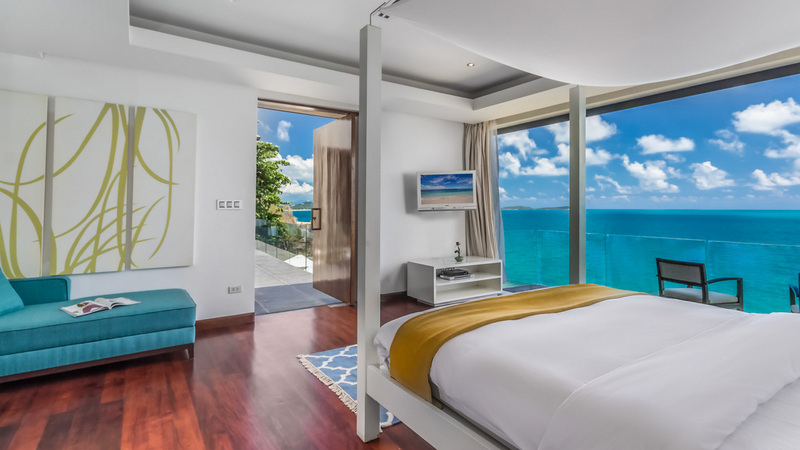 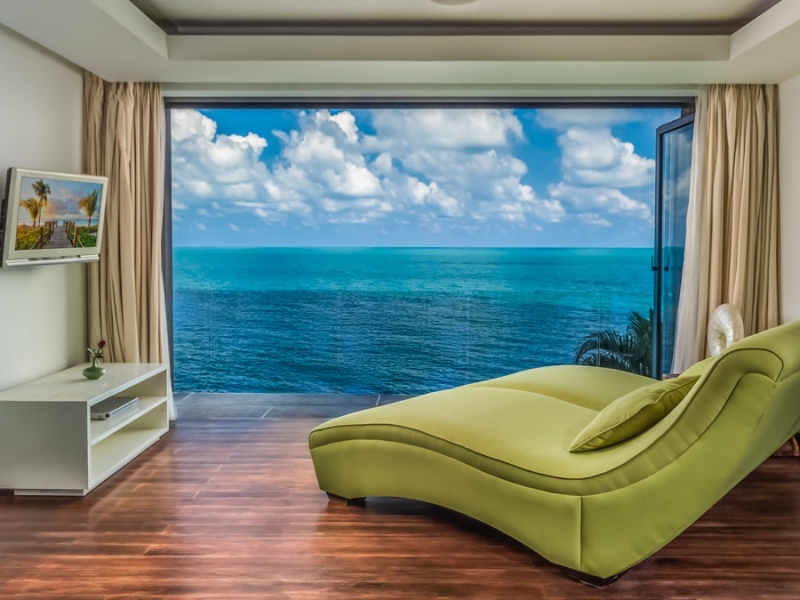 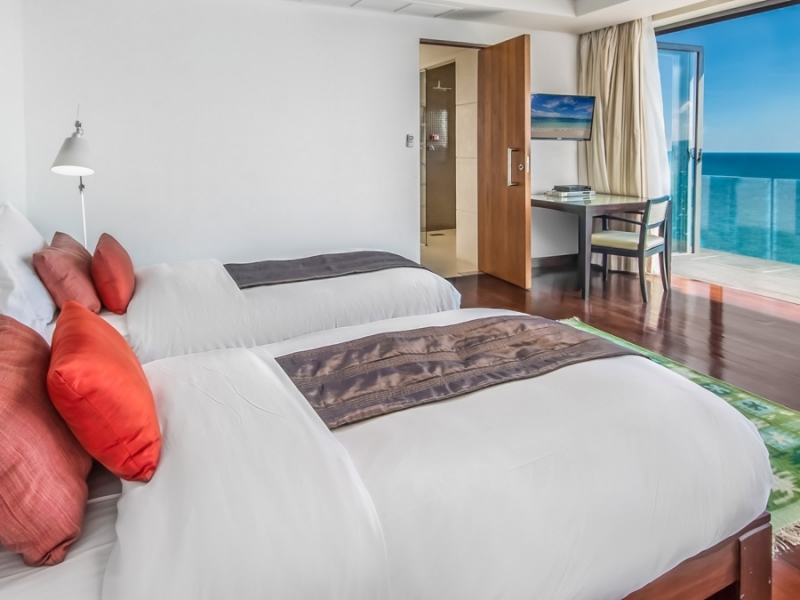 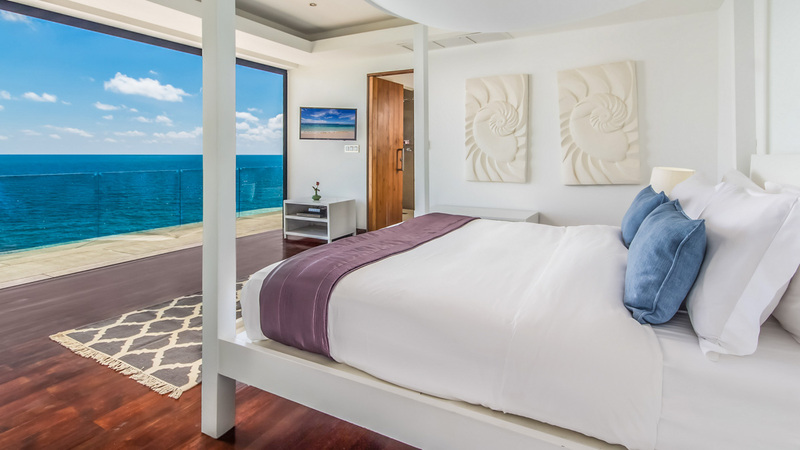 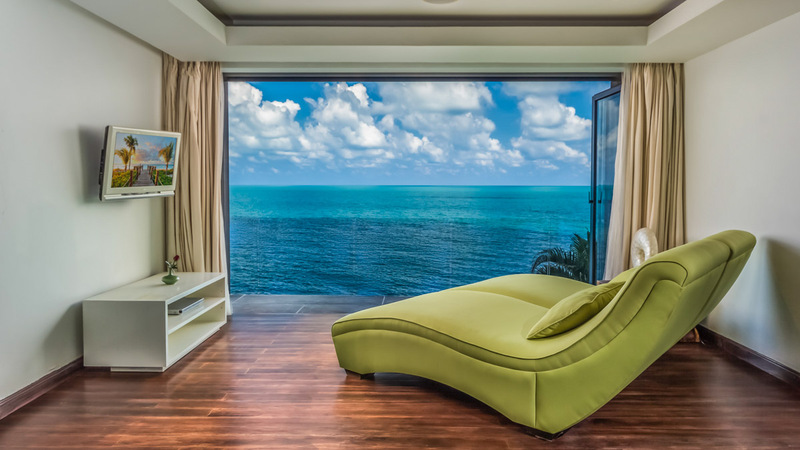 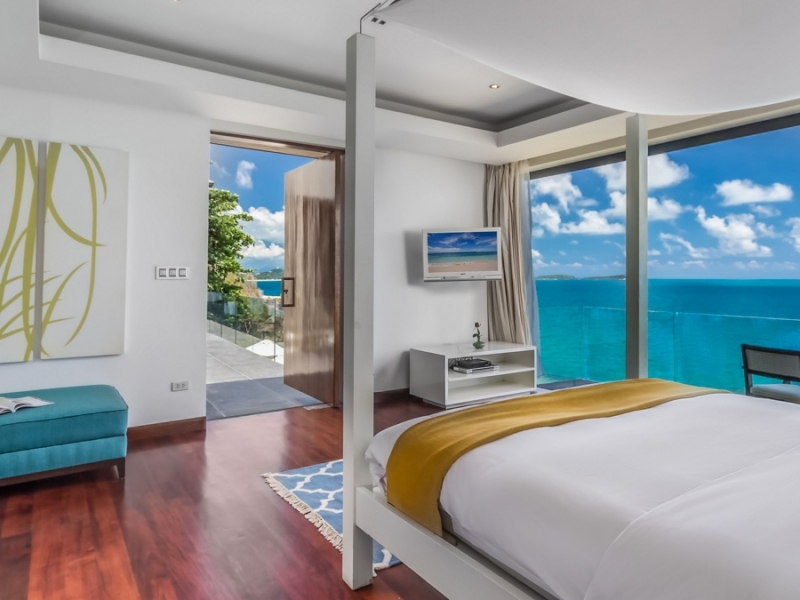 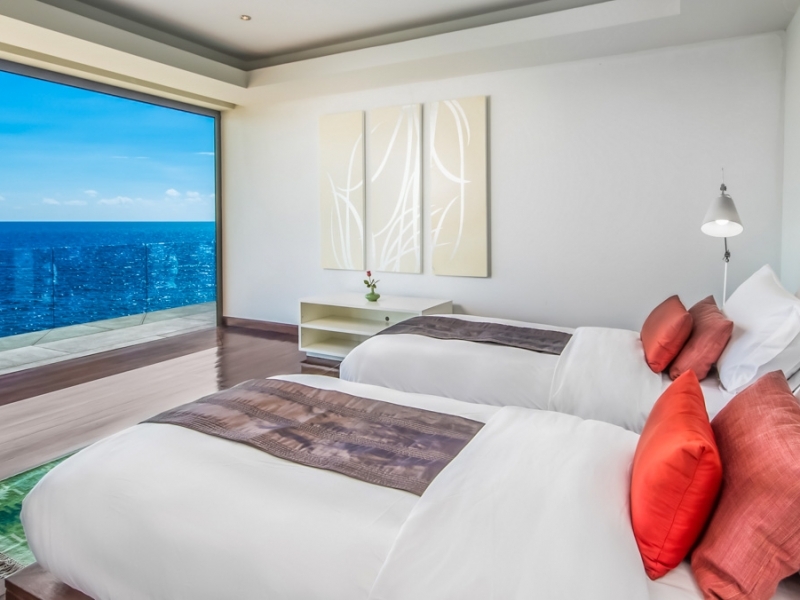 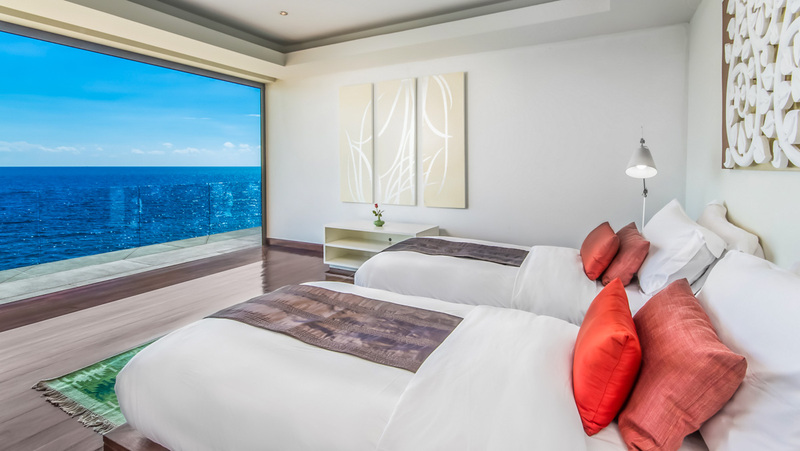 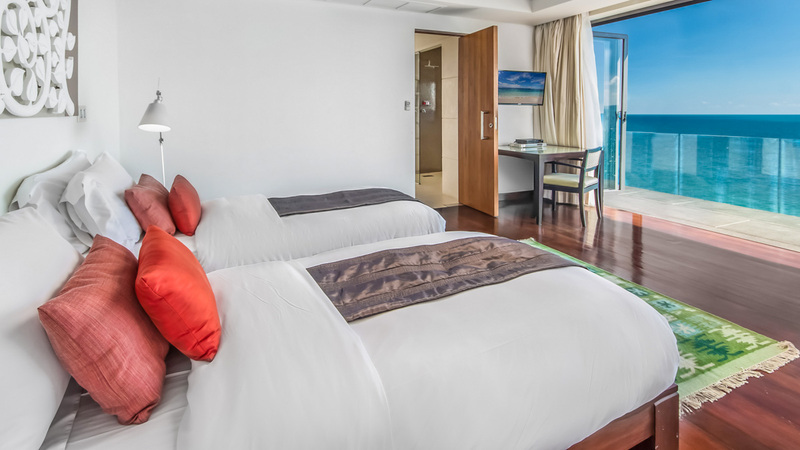 At the entrance of the room is a sea view lounge that may be used for a extra space for single beds, or simply as a private lounge. 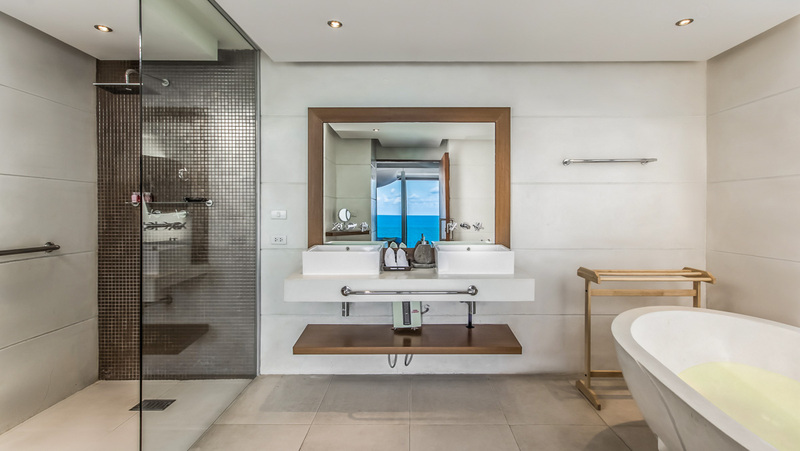 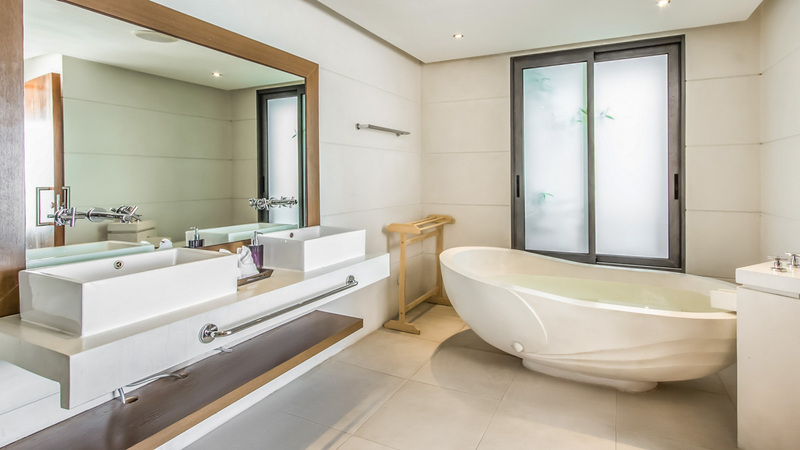 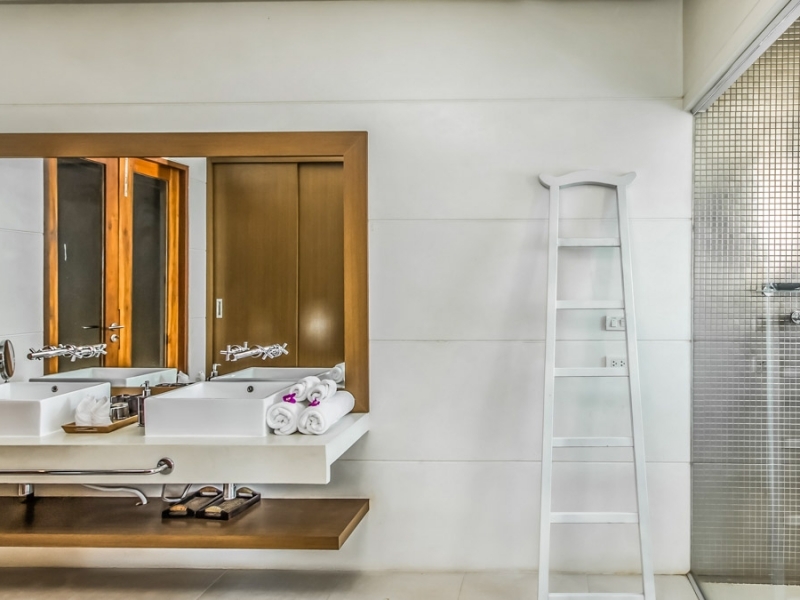 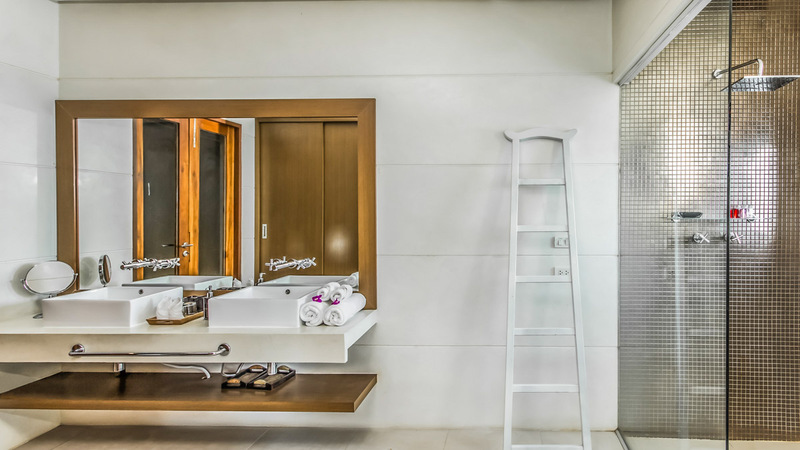 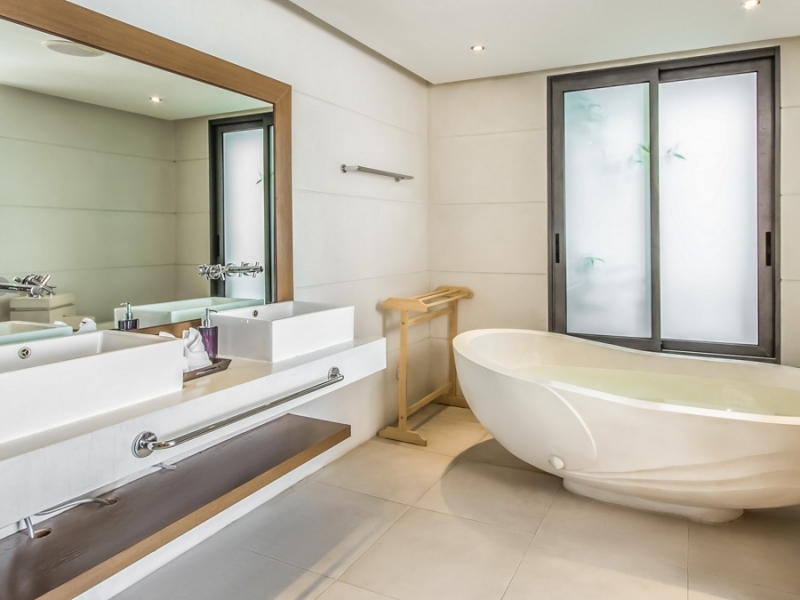 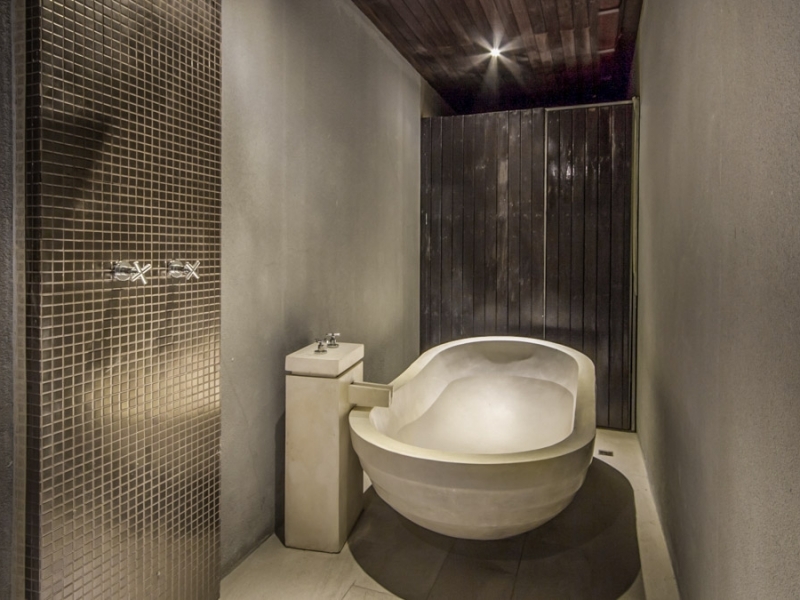 This space contains a large walk-in wardrobe adjacent to an ensuite bathroom with a terrazzo bathtub, separate shower, and his and her sink. 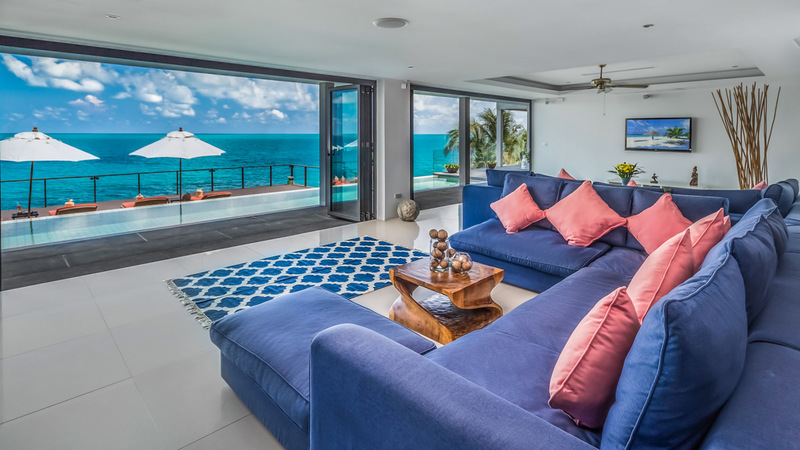 The lounge, dining, and kitchen pavilion feature large lounge sofas, handcrafted wooden tables, a 52-inch Sony LCD TV complete with a modern surround-sound system, iPod dock, satellite TV connection and a Bose system. 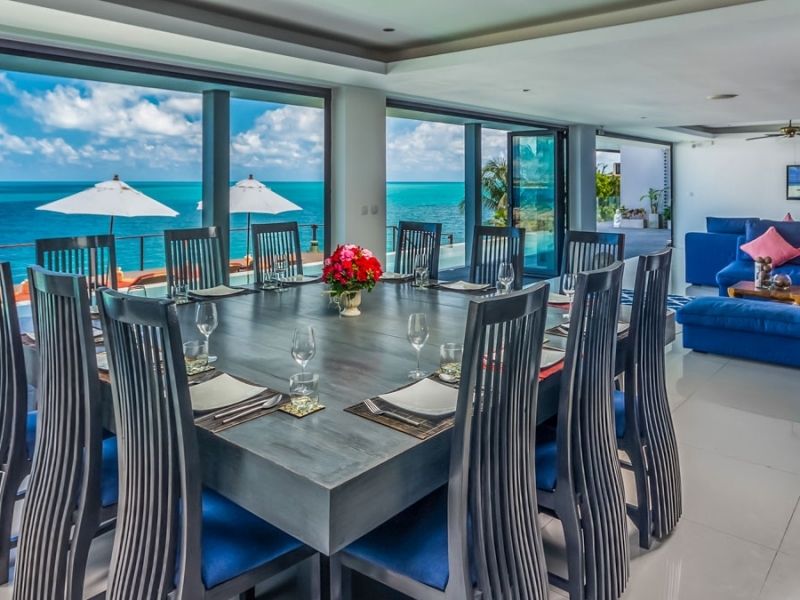 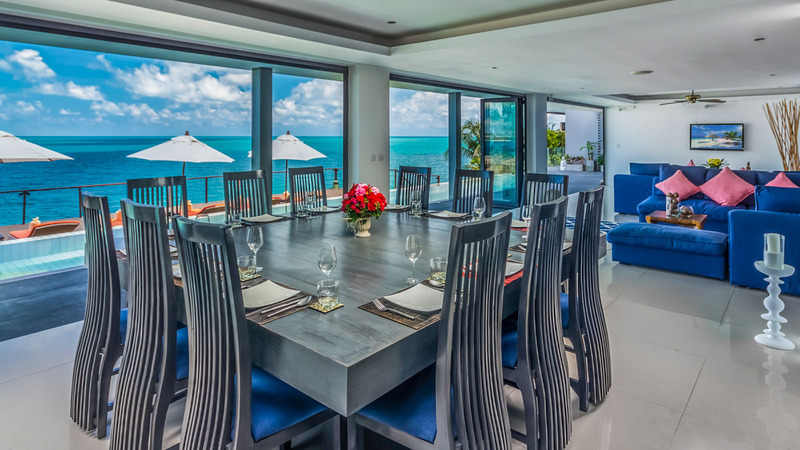 The villa’s large handcrafted dining table seats up to 12 guests, to enjoy watching their food being prepared by the villa staff right before their eyes, at the same time it has the 180-degree view of the ocean. 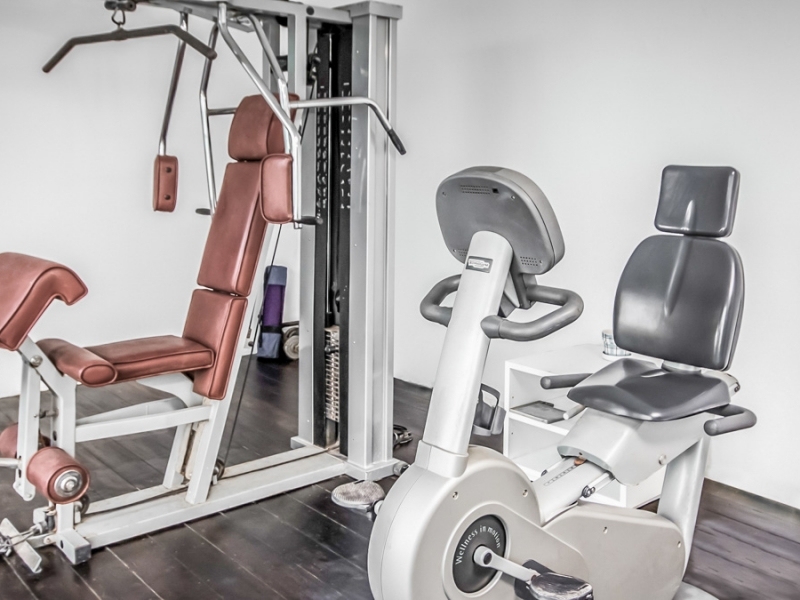 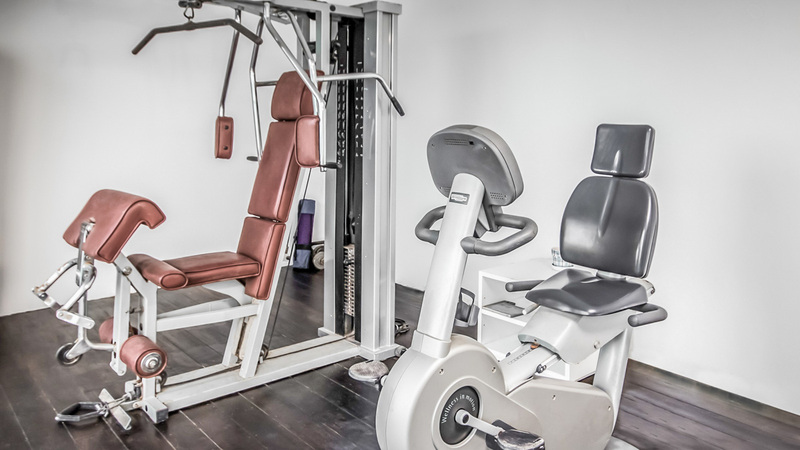 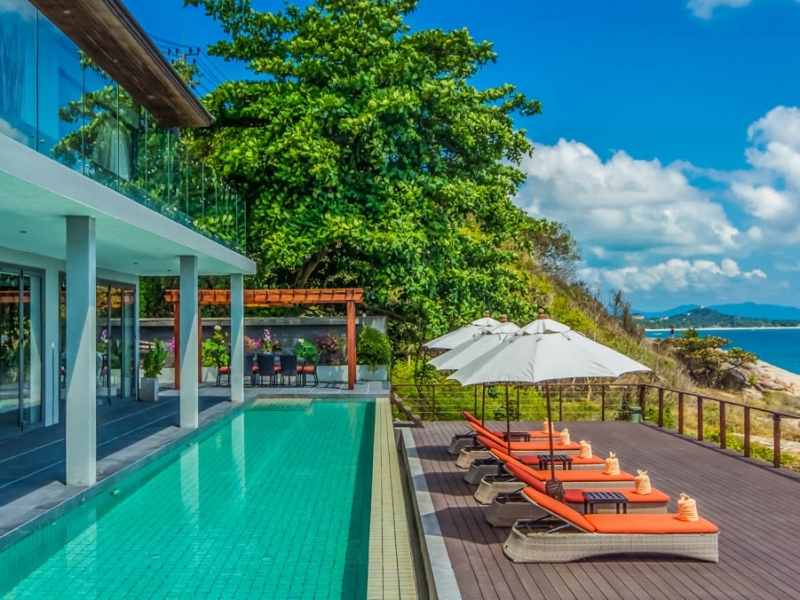 Located in Chaweng Noi next to the well known Lad Koh Viewpoint Landmark, the Villa is a short drive to the main center of Chaweng, with its many restaurants and nightlife. 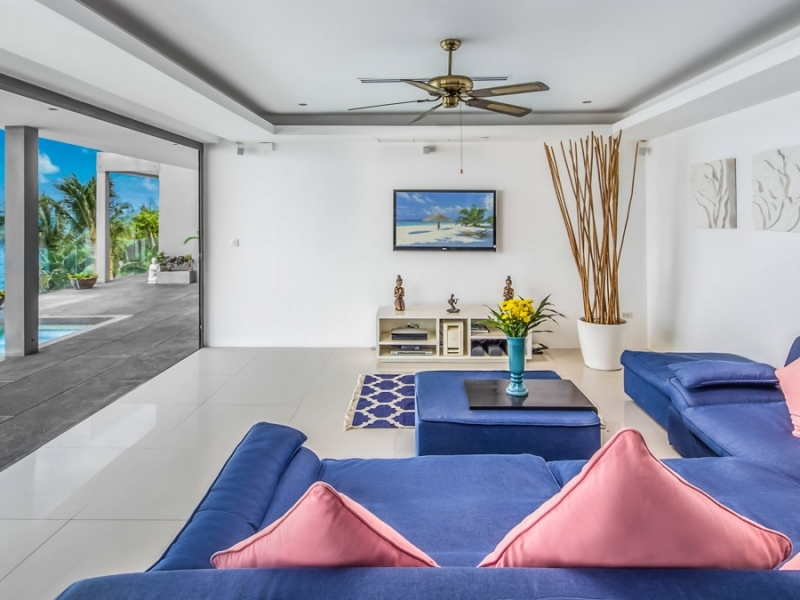 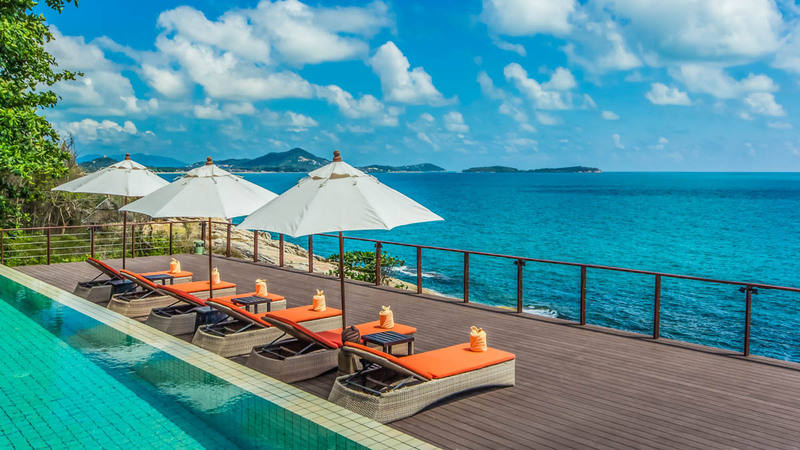 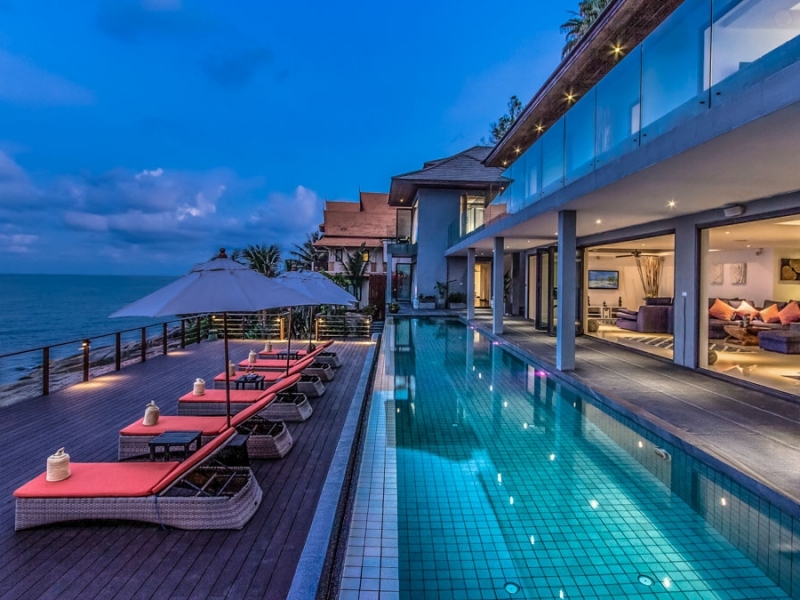 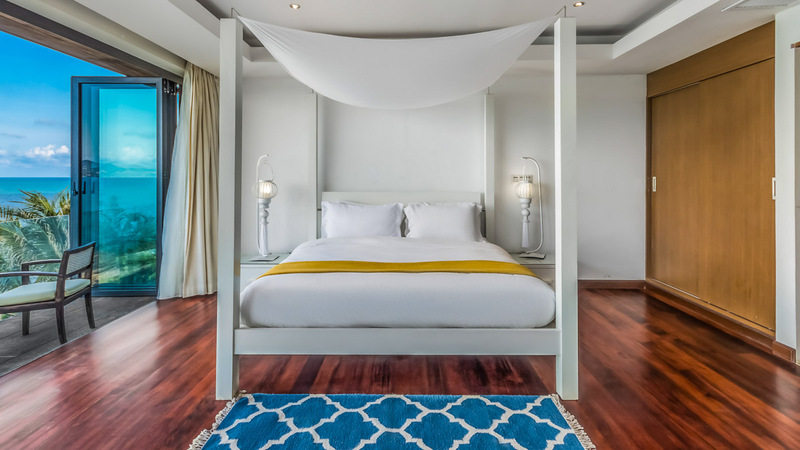 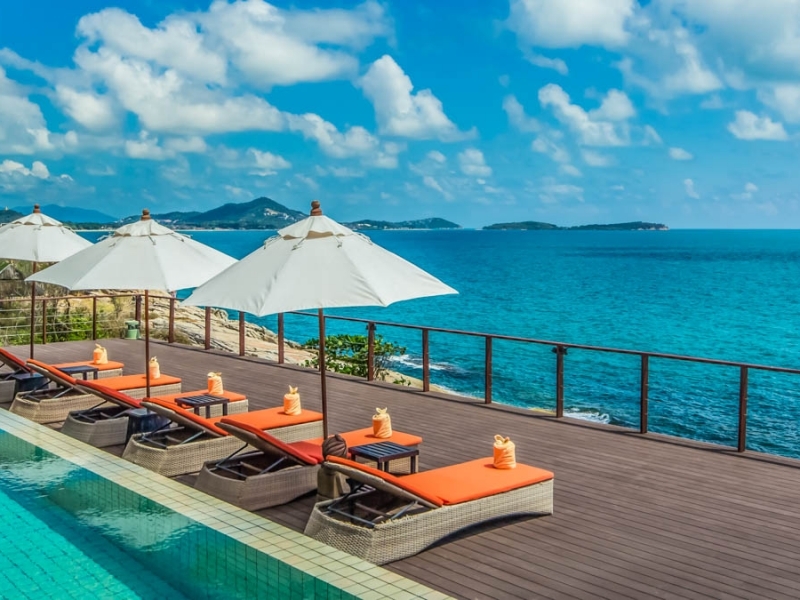 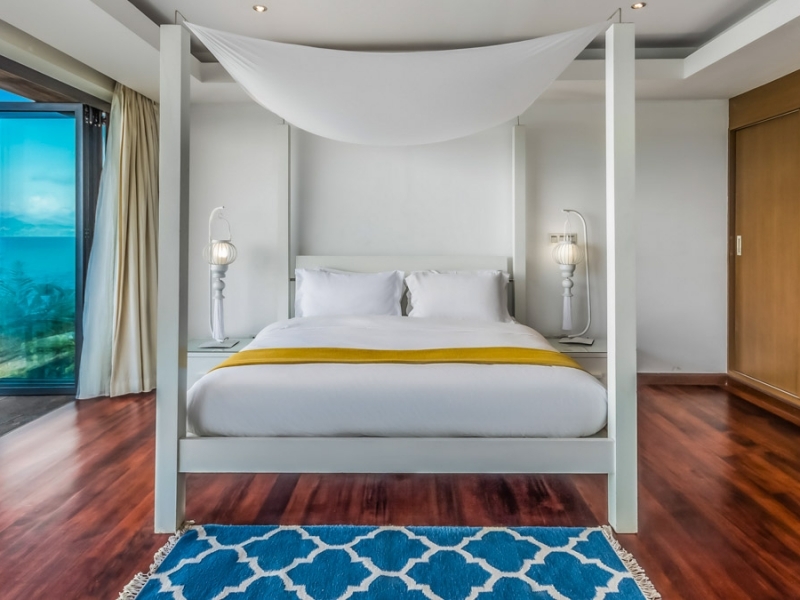 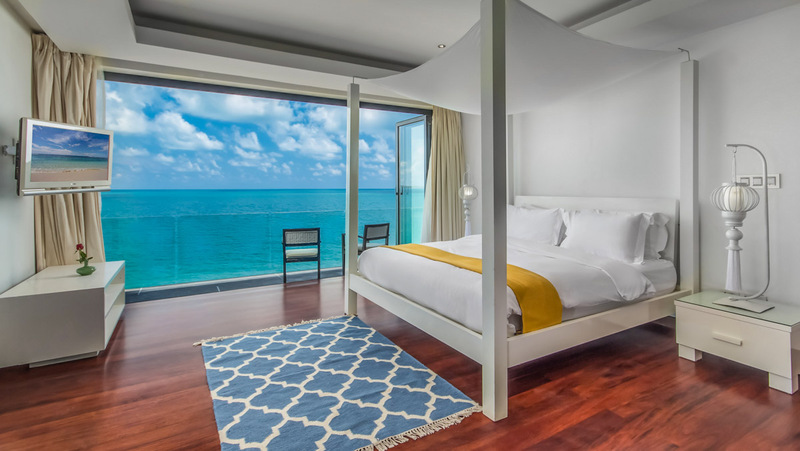 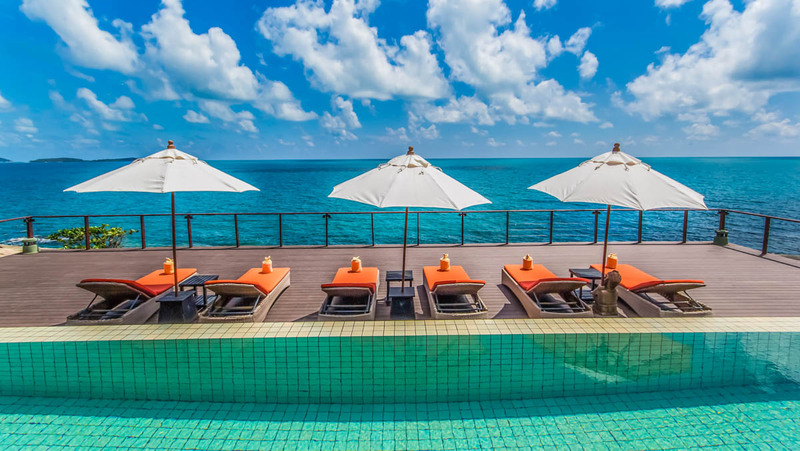 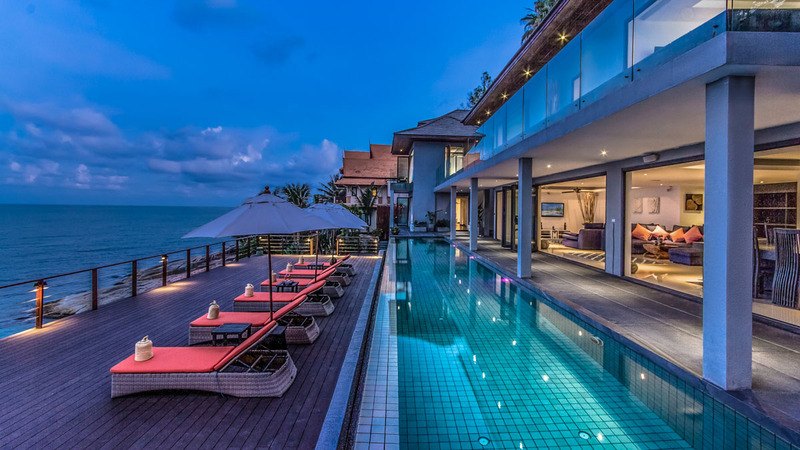 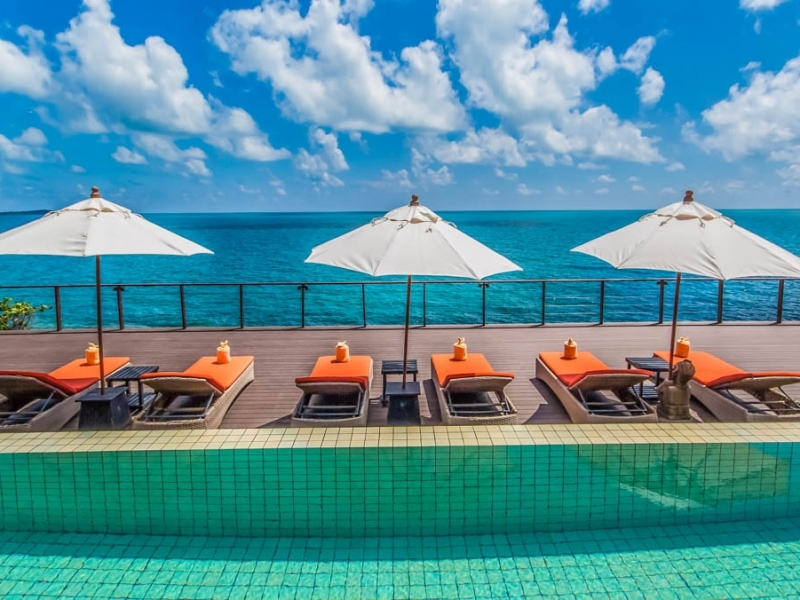 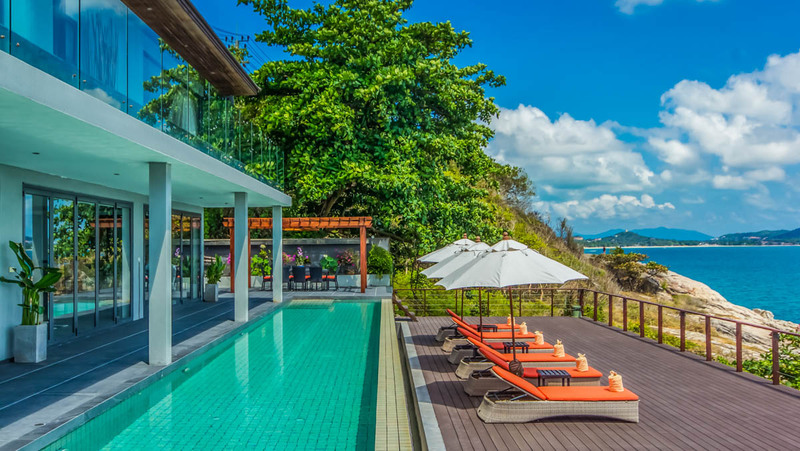 Located in Chaweng Noi, beside the prestigious Viewpoint Landmark on Koh Samui’s eastern coastline a few minutes from the fantastic beaches of Chaweng and its’ exciting nightlife and 10 minutes from Lamai Beach. 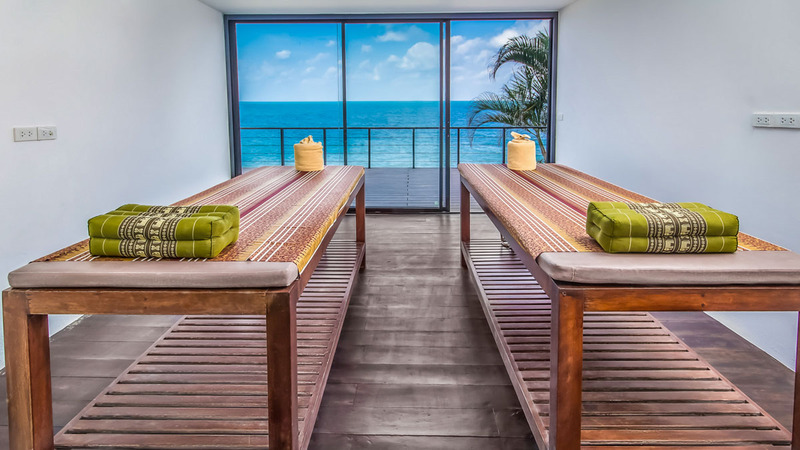 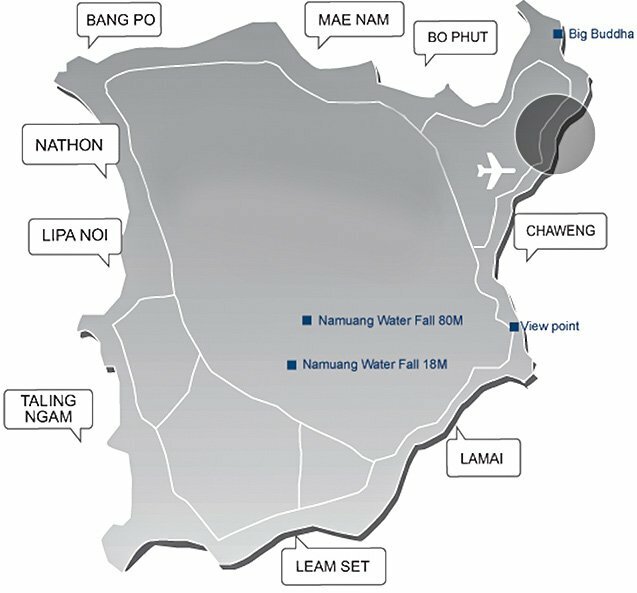 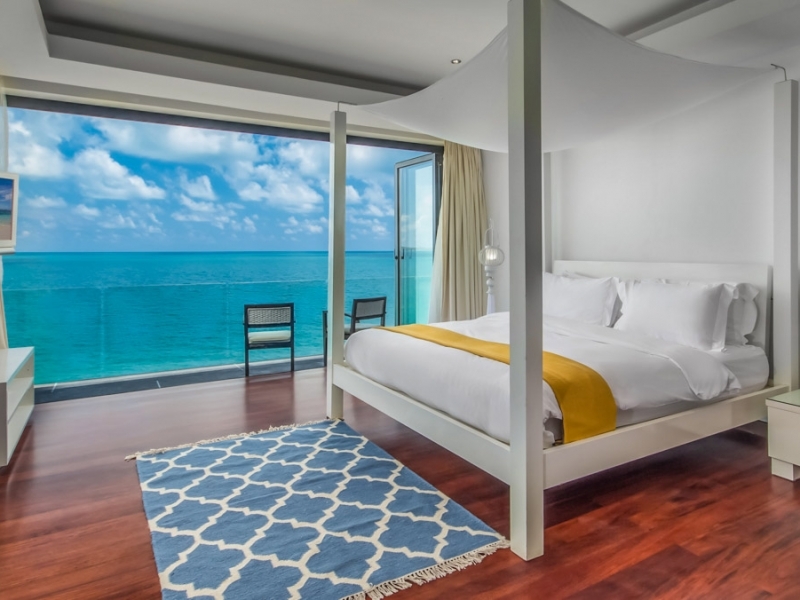 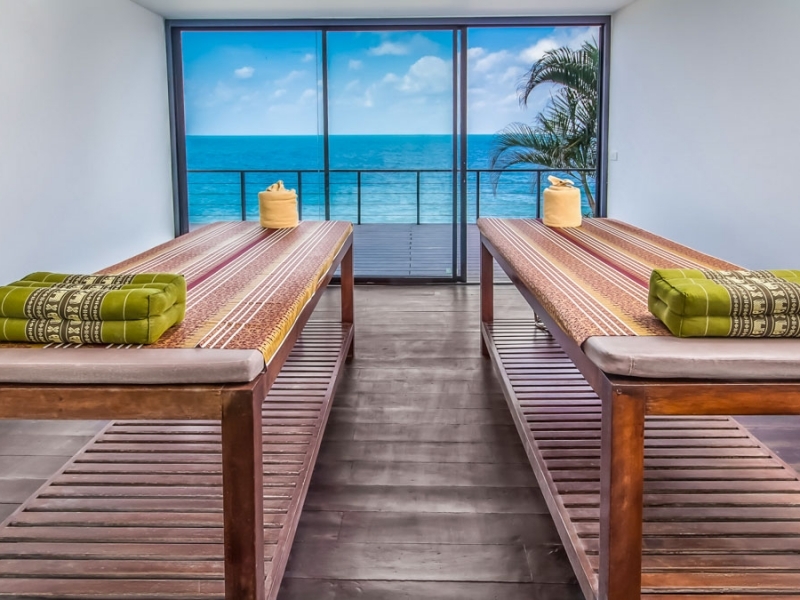 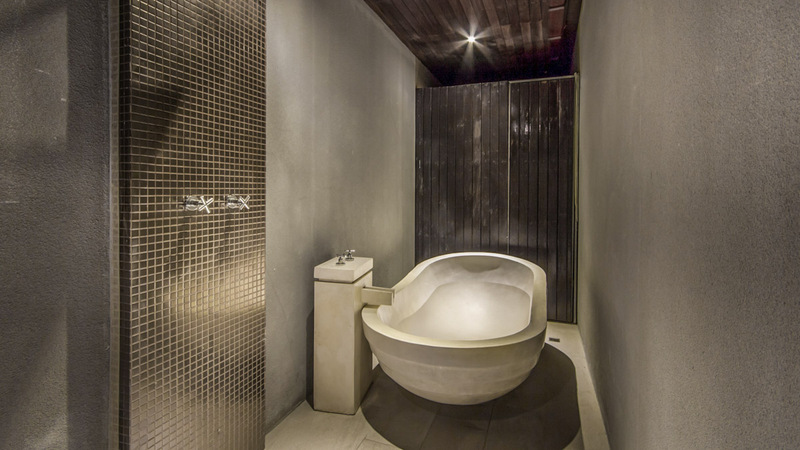 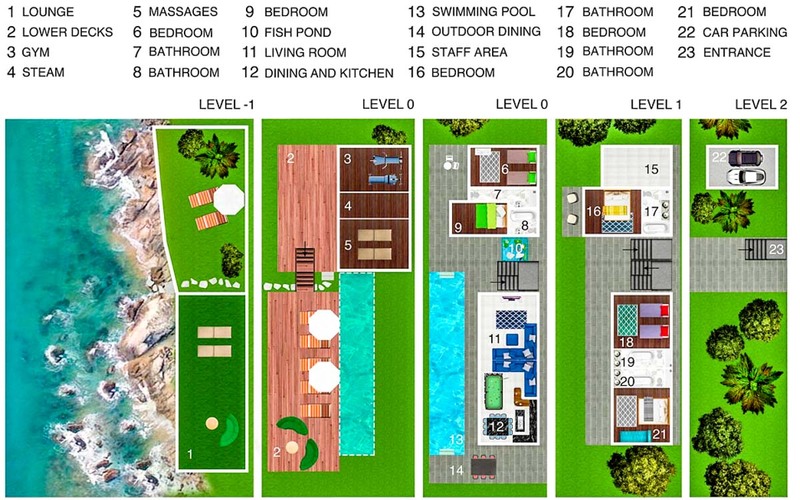 With a convenient location directly between the picturesque beaches and exciting night life of Chaweng and Lamai.